AFRICA IN VENICE is a course that will give you a historical overview of African participation in the Venice Biennale from 1922 until today. The course will focus on a geopolitical approach to the global contemporary art scene. Together with leading figures of the biennale we will investigate what role contemporary African art is currently playing in big European and North American art exhibitions and events. What is the relation between the global and the local narrative in the contemporary art world of today? What does a pavilion mean in terms of representation? What is the relationship between art and politics? The course will focus on the growing number of African pavilions at the Venice Biennale and will address the relationship between art, society and politics. The course aims to give you an insight into the history of the biennale and the politics of representation at the same time as you will gain crucial knowledge about and experience with the contemporary African art scene of today. Through dialogues, participation and a hands-on creative workshop with high level artists and curators this course will give you the tools and the network to understand and work with global art production, public programming and exhibition making. You will learn how to create a knowledge-based and strong concept. The goal of the course is to transform you from consumer to active producer in the cultural field. Q&A sessions, lectures and artistic workshops with the content creators of the Biennale and its satellite exhibitions will give you insider knowledge of creating valuable and relevant art projects. We will work together on your creative skills and provide the support you need to turn your idea into reality. Rikke Jørgensen is an Independent Curator, Director of the communications agency UrbanArt Communications and Founder of the Arts & Globalization Platform. She graduated with an MA in Comparative Literature, Art History and Communications from University of Copenhagen, Denmark, and Université Paris Diderot in Paris, France. She works on projects that combine artistic creation, reflexion, discourse, research and cultural action. In 2004 she founded Nørrebro Art Salon in Copenhagen, Denmark – an exhibition and debate space in a multicultural neighbourhood of Copenhagen, Denmark with a focus on intercultural dialogue, inclusion and global artistic exchange within the Danish community. In 2005 she was the project manager of the first Research Festival in Denmark on behalf of the Ministry of Science, Technology and Innovation. In 2014 she founded the association Arts & Globalization, in order to promote intercultural dialogue through contemporary global art and interdiciplinary collaboration. The first Arts & Globalization Conference with the title Achieving Intercultural Dialogue Through the Arts took place in 2015 and aimed to engage with the complexities of the new status of arts and visuality in contemporary art practice and art theory in the context of globalization. It addressed the complex interplay between cultural policy making, art curation and art production. Furthermore the conference promoted minority representation, accessibility and audience development in museums and national art institutions. The background for the first Arts & Globalization Conference was the 10th Anniversary of the UNESCO Convention on the Protection and Promotion of the Diversity of Cultural Expressions 2005. In 2017 Rikke curated the first Arts & Globalization Pavilion in Venice with the program Remembering the Future. In 2018 she curated a Collateral Event for Manifesta 12 in Palermo, Italy together with the Italian curator Valentina G. Levy. The program Art & Connectography: Remapping the Global World through Art had a focus on hyperconnectivity, geopolitics and migration. This year Arts & Globalization Platform will launch Guidecca Art District with the talk and performance program Politics of Space on the 11th of May. Jelili Atiku is a Nigerian multimedia artist with political concerns for human rights and justice. Through drawing, installation sculpture, photography, video and performance (live art); he strives to help viewers understand the world and expanding their understanding and experiences, so that they can activate and renew their lives and environments. For over decade, Jelili has put his art at service of the prevailing concerns of our times; especially those that threatening our collective existence and the sustenance of our universe. The contents of these concerns ranging from psychosocial and emotional effects of the traumatic events such violence, war, poverty, corruption, climate change and that that associated with our warring world have dominate his artistic forms. Born on Friday 27th September 1968 in Ejigbo (Lagos), Nigeria, Jelili was trained at Ahmadu Bello University, Zaria, Nigeria and University of Lagos, Nigeria – Where he was awarded Bachelor of Arts (Fine Arts) and Master of Arts (Visual Arts) respectively. 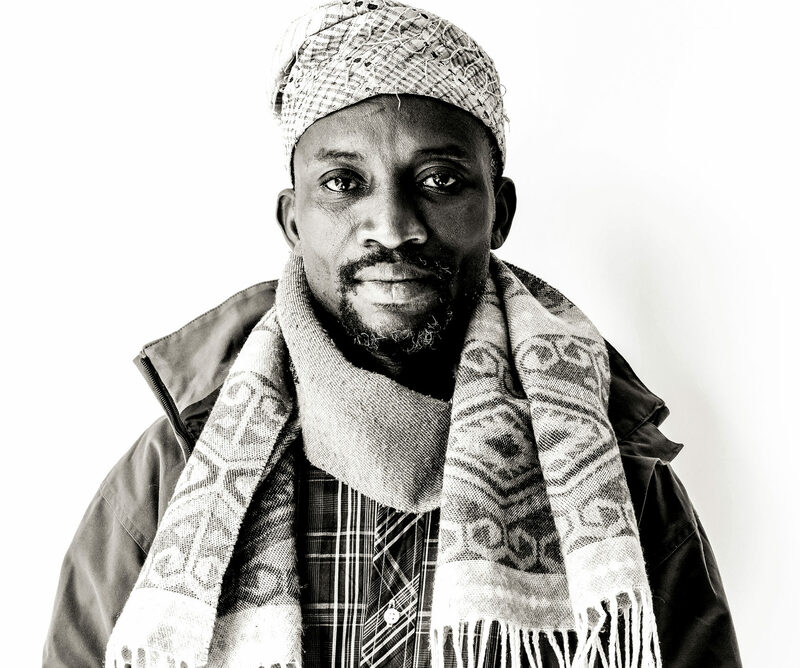 He is presently the project leader of Art Africa Forum; the artistic Director of AFiRIperFOMA – a collective of performance artists in Africa; and Chief Coordinator of Advocate for Human Rights Through Art (AHRA). Jelili has travelled widely and participated in numerous performances/exhibitions/talks in Africa, Europe, America and Asia. The European Cultural Academy was created by the European Cultural Centre with the wish to unite creative communities, increase visibility, build connections and make a lasting impact on participants career. The Academy organises short courses and events in art, architecture and design during the Venice Biennale. The course takes place in Palazzo Rossini located in the historic centre of town next to the Rialto Bridge. The original name of the Palazzo is Palazzo Pisani-Revedin, the Palazzo has its origin probably before 1200 AD but is improved and enlarged in the centuries after. Palazzo Pisani-Revedin, was later named after the Italian composer of ao. "the Barber of Seville", Gioachino Rosssini who lived from 1792-1868 and lived long periods in Venice. What role does representation play at the Venice biennale? What relevance does the different African Pavilions at the Venice Biennale play in relation to the changing relationship between the African continent and Europe today? What is the relationship between art and society? The Venice Biennale is one of the oldest and longest-running exhibitions of contemporary art in the world, dating back to 1895 when the first International Art Exhibition was organized shortly after the unification of Italy. Over the last 120 years, the Venice Biennale has proven itself time and again as one of the most crucial and important cultural institutions in the world, attended each year by over 500,000 visitors. You will get a historical understanding of the Venice Biennale as an important cultural and polical space and an understanding of today's booming African art scene represented in Venice. You will get relevant materials and the opportunity to network with some of the people who push for social change through global contemporary art. Jelili Atiku, Mama Say Make I Dey Go, She Dey My Back, performance at the 57th Venice Biennale, Arsenale, Venice, Italy (Friday May 12 2017). Photo by Andrew Esiebo. We will start the course with an amazing hands-on approach to contemporary African art in order to get a physical experience with and in-depth understanding of what contemporary african culture and art is about. The world-renowned Nigerian performance and multimedia artist Jelili Atiku, represented at the Venice Biennale in 2017 as part of the 57th International Art Exhibition, titled VIVA ARTE VIVA, will give a hands-on workshop on his artistic method and practice. This is an exclusive and very special opportunity to be immersed in the artistic creation of a leading artist who can give you a direct insight into contemporary art practice and Yoruba culture through time. As part of the course you will be invited to participate in a live performance by Jelili Atiku in Venice. Time and place to be decided. The performance by Jelili Atiku will be organized by Rikke Jørgensen, Art & Globalization Platform and Simona Carniato, Studioo non-profit. We will focus on how the space is curated and who have been selected for The 58th International Art Exhibition, titled May You Live In Interesting Times by curator Ralph Rugoff. Since the 1989 exhibition, Magiciens de la terre, curated by Jean-Hubert Martin at the Centre Georges Pompidou in Paris, two major issues have come to the fore. In that exhibition, art works by 50 western and 50 non-western artists were placed in an informal manner so that the works would "speak for themselves". For many viewers, it was the first time that they had seen Contemporary African Art and it opened up the floodgates in the West. The two issues that came to the fore were that: the art works were chosen by westerners who came up with a different selection of artists than the African experts would have selected; meaning that again the West was imposing its own standards. Secondly, from a western perspective, the works were not yet part of the western cannon - an implicit criticism of Western art history. During the 1990's, a group of Africanist scholar curators such as Salah Hassan (Cornell), Okwui Enwezor (San Fransisco Art Institute) and Olu Oguibe (University of Connecticut) challenged the mindset and paradigms of the first wave of Western scholars and collectors. We will investigate and discuss this year´s Venice biennale in the light of theories on exhibition-making and exhibitions that are respected for having challenged the concepts of Western art history. What does artistic representation at the Venice biennale mean politically? How can we learn about the politics of space through financial and preparatory challenges? What does it mean to the people of an African nation to be represented at the Venice Biennale? At the Venice Biennale, the contribution of art from the African continent and its diaspora communities was highlighted and put on the agenda especially thanks to the Nigerian curator Okwui Enwezor, who curated the 56th Venice Biennale 'All the World's Futures' in 2015. The theme set by Christine Macel the year after, "Viva Arte Viva!" celebrated artists and "art for art's sake". After the 2015 edition of the biennale, when curator Okwui Enwezor welcomed visitors with readings from Marx's Das Kapital and included works that expounded on the continued effects of colonial conquests, climate change, and perceived "crises" in migration, the theme in 2017 distanced the biennale from political reflection. Only a few nations supported their artists' presence in 2017 at what Nigerian performance artist Qudus Onikeku called the "Olympics of the art world". Angola, Côte d'Ivoire, Egypt, Nigeria, South Africa, Tunisia, Zimbabwe, and Kenya were the representatives of African national pavilions at the 57th Venice Biennale. This year, Ghana, Mozambique and Algeria will present their first National Pavilions at the Venice Biennale. We will look at the political meaning of a pavilion at the biennale for African countries. From African cultural treasures to artworks and even human remains, calls have been growing louder to return "goods" appropriated by colonial powers during their often brutal reigns across Africa. What does it mean for the African population and for the relationship between Africa and Europe? What does Art Repatriation mean to the young Africans? Pay the full tuition. We use the most advanced payment security systems. One week before the start date you will receive an email with all the organizational details. Welcome to Africa in Venice!